More and more, the articles about visual art that are hitting my news feed are from business journals rather than art ones. This is because the recent insane auction prices for paintings, and a general fever about art prices worldwide, are stoking ever greater curiosity among financial institutions and funds about art as a reliable investment vehicle – as an “asset class,” in the chilling language of the MBA. The new talk is of instituting an art market blockchain – i.e. an unhackable, accurate and transparent digital ledger of art prices. This would make trading safer and more uniform. This, according to business media, would enable the banks to begin to use art as a “financial product” or “instrument” just like stocks or futures. Art prices would then really rise. Wouldn’t that be great for art? 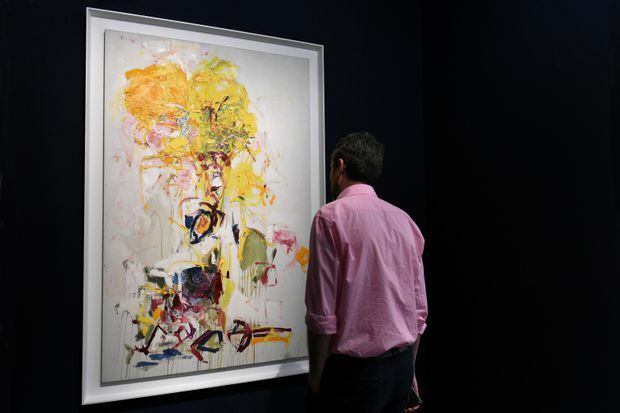 The artwork by Joan Mitchell titled Composition sold recently for $14 million. So far the purchasers of the world’s most expensive art are egomaniacal individuals, not banks, and their motivations for spending their millions are complicated: They are buying more to enhance their own prestige than to obtain a financial return. So far, banks and funds are not directly involved in placing their own bids at the auctions because this market is notoriously corrupt and unreliable. Prices even at auction are often fixed in advance (by “guarantors”); there is collusion among owners and sellers to keep prices inflated; there is a cabal of insiders that runs everything; prices are often inflated to the press and real prices are kept secret; even ownership is kept a secret to enable tax evasion … the list of deviances from a real open market goes on and on. But if blockchain comes along, real prices will be public and trackable. Blockchain will also facilitate “fractionalization” of art ownership – in other words, the buying and selling of shares in a single work. According to The New York Times, the Singapore-based online gallery subtly named Maecenas is promising to take an Andy Warhol silk-screen, supplied by a London gallery, and sell 49 per cent of it as shares of US$10,000 each on its planned blockchain trading platform. The result will be that each painting becomes a kind of mutual fund. The dealers claim, amusingly, that this access to ownership or a fraction of an investment “democratizes” art ownership. We have reached a point where such terms have begun to mean their opposite. According to the report called Art Market 2.0 written by British academics at the Alan Turing Institute, the “financialization” that could come from the new technology could lead to “an explosion of liquidity and value.” This does not sound like democratization to me. Obviously the results of all this increased speculation is disastrous for art itself. Things are already bad enough. Already many ambitious young artists set out vying to please rich collectors instead of critics or peers, and the results are gimmicky and garish. (That class of investor seems better pleased by simple than by subtle.) Already the perception that art is a commodity for speculation has undermined its credibility as a force of social criticism. Who can take seriously the pious anti-capitalist laments of every international art show when the VIP patrons of those shows are buying all the revolutionary statements to store on their yachts? Look at the derisive response of just about every critic to the blockbuster show of privately owned Banksy prints in downtown Toronto this month. For $35 a ticket you, too, can get up close to the cheeky subversion of this underground graffiti artist, conveniently removed from its anti-social context, and you can enrich a group of investors and contribute to the gentrification of artists’ spaces at the same time! No wonder we are all feeling rather skeptical. A prominent example of this is currently on display at the Victoria and Albert Museum in London: The artist-in-residence there, Rachel Ara, has installed a work called This Much I’m Worth. It calculates and displays its own value as viewers stand in front of it. It consists of a bank of computers running an algorithm that combines a few factors – including how many spectators are gathering around it moment to moment, as perceived by attached cameras – to estimate its auction price. This changes on a large display of neon tubes. The artist has said that the piece is a critique of art investing. It’s very clever. But I wonder whether Ara might make even more powerful art if she turned her attention to larger themes, possibly even themes that aren’t about the lives of professional artists. There will be no stopping the blockchain technology that will “financialize” art and enable speculation in it to become even more volatile and abstract. There is probably nothing anyone can do about it. And what we will end up with is art whose primary function is to be the word’s most concrete example of income inequality.